Arizona is a beautiful state with some of the most diverse landscapes and climates in the country. The northern part of Arizona sees snow, while the central and southern parts of the state are known for their hot and dry desert climate. Phoenix and Tucson are both areas where residents need to be conscious of their water use and their contribution to pollution. If you’re a homeowner that has an Arizona sod lawn, here are five eco-friendly ways you can tend to your lawn. Be conscientious when watering. It's very common to overwater your lawn, even with Arizona sod, and especially during the hot summer months when homeowners attempt to compensate for the hot weather. Look for signs of overwatering such as pools of water on the lawn or moss growing on the sidewalk. Use push mowers instead of gas mowers. Push mowers require zero fuel except for your pure man (or woman) power! While gas mowers have become the norm, they are actually not necessary to maintain a beautiful Arizona sod lawn. 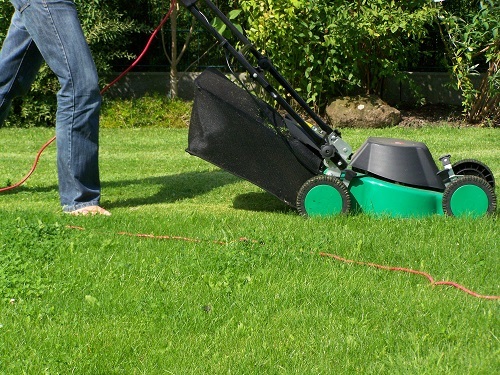 You can purchase eco-friendly push mowers at home improvement stores. When your neighbor asks why you don't have a gas mower, tell them you're doing your part to help the environment! Maybe they will join the trend. Use a rake instead of a leaf blower. Ask yourself, "Do I really need a leaf blower?" They are loud and smelly, they disturb your neighbors and worst of all they are not good for the environment. Why not trade in your leaf blower for a standard rake? It only takes a little bit more time than the leaf blower, plus you'll tone your arm muscles in the process! Let's face it, most parts of Arizona don't see a ton of autumn leaves like some states back east, so a rake should be sufficient in maintaining your Arizona sod lawn. Stick to local plants, flowers, and grasses. Native plants are going to grow best in your yard, so if you want flowers and plants incorporated into your landscape, try to choose ones that are native to your area. If you’re not sure which plants are local to your area, check with your neighborhood nursery or your professional landscapers to confirm which plants will be best for your yard. Buy sod from local businesses. Like flowers and plants, grasses that aren't native to your region will require more maintenance and often more watering. It’s best to buy your Arizona sod locally as it supports local business and you can ensure you’re choosing the right type of grass for your home and climate. Which grass you choose also depends on how often your lawn is in sunlight. For help choosing the right type of Arizona sod for your lawn, answer three questions from our lawn selector tool. Your answers will determine the absolute best sod for your Arizona home. For more information on Arizona sod, visit our website or call one of our Arizona sod specialists at 480-456-1199.